My sons' hair grows super quick. My husband will trim it himself once a month, but every quarter I like to get it professionally cut to give it a nice shape, which we can then maintain ourselves after. 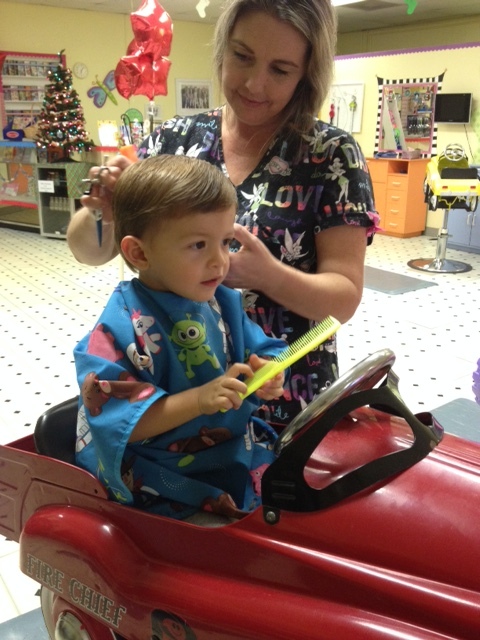 Like I wrote in my Babies' First Haircut Post, you're better off paying a little more or driving further to find a salon geared to children only. We went once to a regular hair studio and it was a nightmare - stressful for everyone. Since moving though I've been on the lookout for a similar studio for kids down here and luckily I finally found one over in Ft. Myers - Bananas Salon. 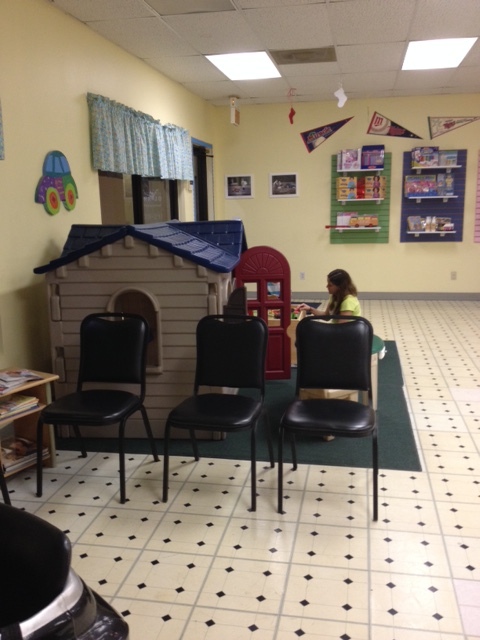 Inside, they have a whole play area, which kept the other half of my duo entertained while his brother got his hair cut. They have a wooden train set and a clubhouse, which they both closed themselves in when it was time to go not wanting to leave. I had to knock on the plastic door and go in after them. Instead of chairs, each hair-cutting station has a different car for kids to sit in from a fire engine, police car to a pink power wheels jeep. My boys sat in the fire engine seat and enjoyed playing with the bell and spinning the steering wheel. In front of each car they also have a TV and DVD player. When we arrived they asked us what film or show from their collection that we would like. They had about 50 titles to chose from too. We went with Mickey Mouse Clubhouse. All of these distractions made for a really easy experience. Their stylist, Keri, was a pro at weaving around their bobbing heads in order to deftly cut their hair. She was even able to use the electric shaver at the end to get the little fuzzy hairs on the back of their neck. Be sure and sign up for their mailing list for coupons and other discounts. They don't over e-mail either.